Sometime back my mom noticed this little thing grow in one of the plant we have at home. 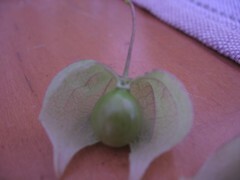 We couldn’t figure out what it is and also don’t know whether it’s a wild plant or something you can eat. Apparently later our servant clarified that you can eat that little seed like thing found inside – but I don’t think any of us really wanted to try it out. I was wondering how cool would it be if we had an image search where I could upload this image and maybe an engine would give me some information on what it sees in there. This way I could get to know what this is called. I am guessing somebody in a lab somewhere is working on something like that while we discuss this here. BTW, would love to know if you know the name of the plant …. or even know if there is a image powered search engine. Previous Post Book Review: 2000 insults for all occasions Compiled by Louis A. Safian. This fruit is called as ‘Nei Thakkali’ in Tamil. Literal English translation would be ‘Ghee Tomato’. I’ve tasted this fruit during my childhood days. 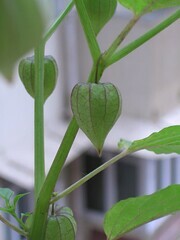 The color of the fruit changes to light brown once it is ripe. Believe me, it tastes so delicious.